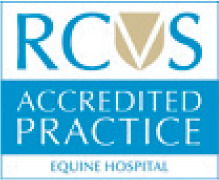 The Sussex Equine Hospital places a high value on the service and care that we provide to our clients and their horses and we are constantly striving to improve this in any way that we can. As you will all no doubt be aware horses frequently object to us performing many of the diagnostic procedures required as part of the day to day management of their health and wellbeing. We constantly review our health and safety protocols and have identified certain procedures which have a greater potential to cause harm to the personnel handing the horse, should the animal react badly. Scoping and/or twitching horses creates an increased risk of horses reacting badly, and as you will know they can rear, strike out, kick or trample those involved. To try and minimise the risk of potential injuries that could occur, we will now request that all stable staff, trainers or anyone else assisting the veterinary surgeon to perform scoping and/or a procedure requiring a twitch, should wear a helmet and enclosed shoes. There may also be other circumstances that the veterinary surgeon in charge deems to involve a greater risk of potential injury to handlers with an individual horse. In those circumstances we will request that the people assisting wear appropriate health and safety attire before proceeding. We would be grateful if you could help us with this initiative by advising your staff of this requirement so that unnecessary delays do not occur while appropriate attire is acquired before a procedure can be started. Please do not hesitate to contact us should you have any queries regarding this matter.